Skateboarding dogs are a dime-a-dozen nowadays (no dis, Murdy), but a skateboarding cat? 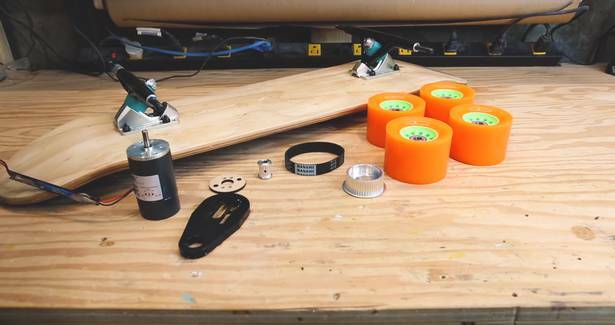 The notoriously finicky pets are loath to come anywhere near a board, but one man—some would say a visionary—has devised an amazing contraption that might change that. 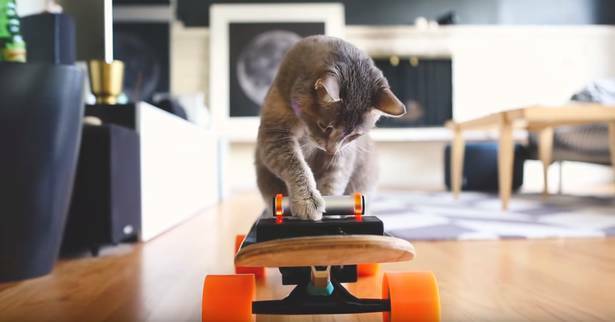 Kim Pimmel, an AR designer for Adobe, has made a habit of building toys for his cat, MIDI; he obviously has the design chops, the only question is whether the cat be interested. So… the centerpiece of his electric skateboard is a throttle lever that dispenses a treat. (Like we said: genius.) And MIDI eats it up! Pimmel sourced the parts cheaply, using Adobe Illustrator and a Glowforge laser cutter for the treat dispenser. He shows how to do it yourself above. Subscribe to Pimmel’s YouTube channel for more amazing inventions, like this pinball machine that MIDI seems to love. Here is the list of components in case you get bored this winter: Adafruit Feather M0, Adafruit Feather Motor Wing, Lipstick USB Battery Pack, Tenergy 12V 2000mAh NiMH Battery Pack, Orangatang Kegel 80 mm uxcell DC 12V 2000RPM, Brushed Electric Motor 45mm, XCSOURCE Pulleys And Motor + Belt + Bracket + Screw Tool, Set Skateboard deck and trucks from local shop, RuiLing 2-Pack Right Angle USB 3.0 Adapter, Micro USB 2.0 A Male to Left Right 90 degree Angle Micro, Misc scavenged/random parts from the studio. Two Battle At The Berrics champs go for the hundo. As a grain, barley is barely burly. But, as a skater, Barley is always gnarly. The Finals will take place on October 27 in Shanghai, China. Here is the confirmed list of competitors. Rye Beres filmed this clip, which appeared on Sandoval’s Instagram. Be warned: this is excruciating to watch.